The race begins at Chestnut Hill Reservoir behind Reilly Rink on the corner of Beacon St. and Chestnut Hill Ave. in Brighton, MA. 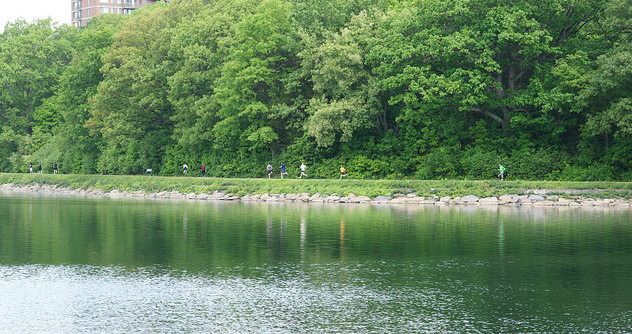 It is a fun, flat and beautiful 5K (2 full loops) and 10K (4 full loops) course around the reservoir. There are no road crossings making it easy to walk, run or stroll with your kids, friends, and/or dog. This is a legitimate 5K (3.1 miles) and 10K (6.2 miles) and each runner will have an electronic chip on their bib which will give them an exact time for their race. Timing is being handled by Race Menu. It is easily accessible from the Cleveland Circle T stop on the Green Line “C” branch or the Reservoir T stop on the Green Line “D” branch, which are both right at the reservoir. There is metered parking all around the reservoir if you plan to drive to the event.